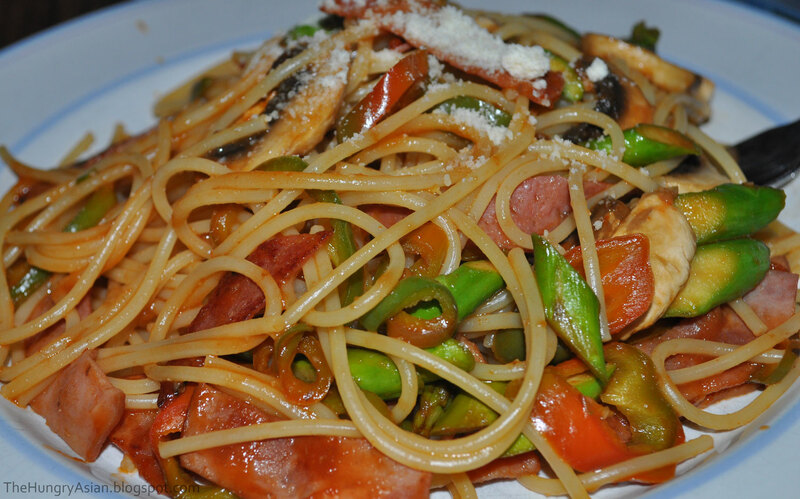 This is my version of ketchup spaghetti, I think there is a name for it in japanese but I'm not sure! I know it sounds gross but it's good! 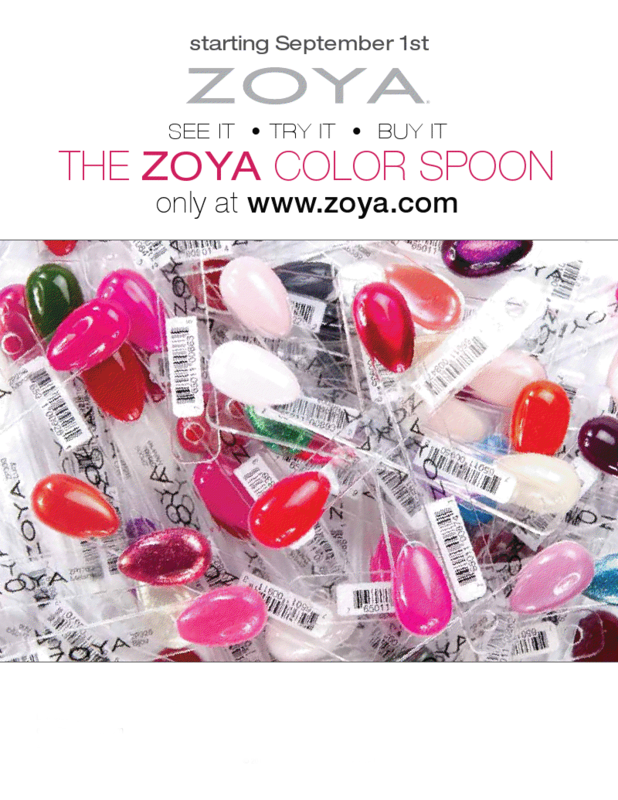 I'm wearing Color Club Jewel of a Girl today, I love fall! I mixed hair colors to get it back dark for fall. 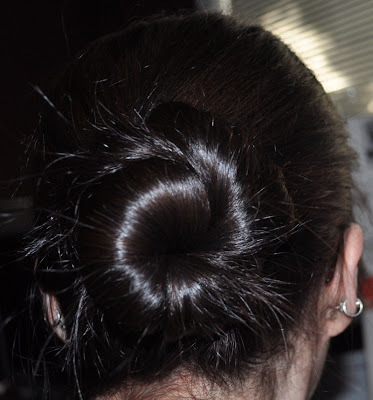 I use Clairol from Sally's. I mixed 2 parts neutral dark brown with 1 part neutral light brown then equal parts of developer. I did a pretty boring bun on Friday lol. 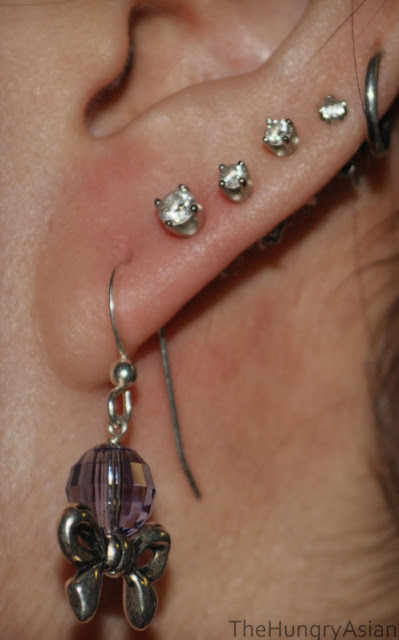 Steph from DSK Jewelry and I did a swap a few weeks ago you can see her post here. 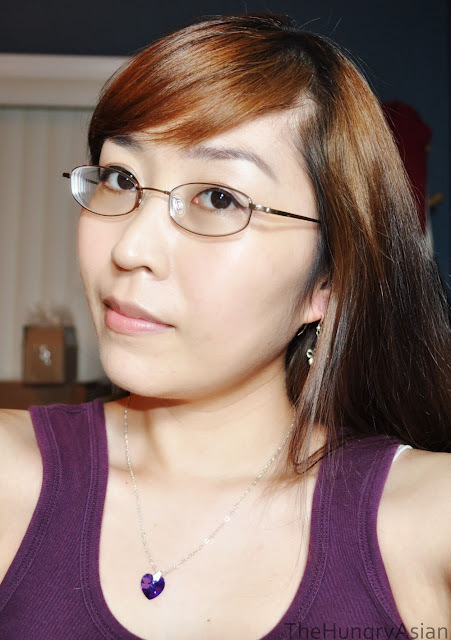 She sent me a couple of necklaces and some adorable purple bow earrings! Darn my hair for covering up the earrings. 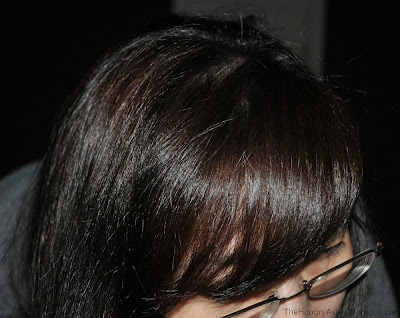 I need to dye it dark again badly, my roots are like 2 inches lol. Since I took this picture I mixed my own blend and dyed it a very dark brown, whew! 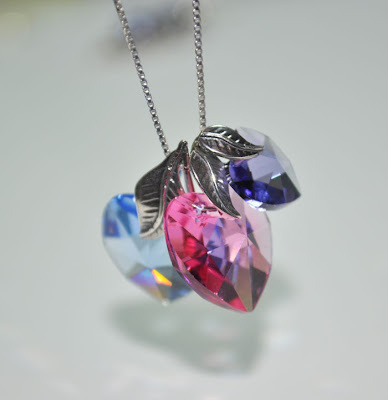 I'm wearing a purple crystallized swarovski heart on a heart chain, so pretty! Here is the other necklace she sent me, I told her I liked pink, purple and blue so she made one with all 3 colors! Thank you so much Steph! I need to take pictures of my lashes now and send you some comparison shots, it's been 6 weeks or so now. I felt like I did not do Untamed Luxury any justice in my review so I took a stab at taking a better photo of it. It's so weird VNL photographs but in person you can't see it. I cut my nails short so I haven't been taking any pictures! I have some long due reviews I need to type out so that should buy me time while the nails grow out. Have a great day! I'm so hooked on glitter frankens! I do need to play around with colored bases more tho. I thought I would name this one NYFW for fashion week! 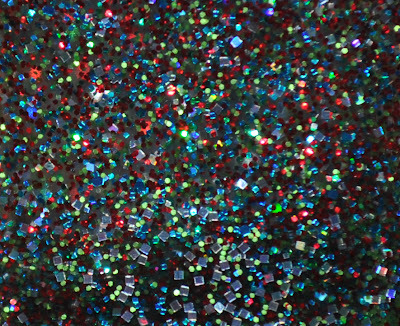 Blue, red and green glitter. 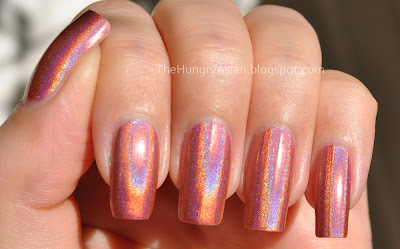 The base is Wet n Wild Hallucination I think (the clear one with holographic square glitters). A close up look. I love making glitter frankens it is so much fun! 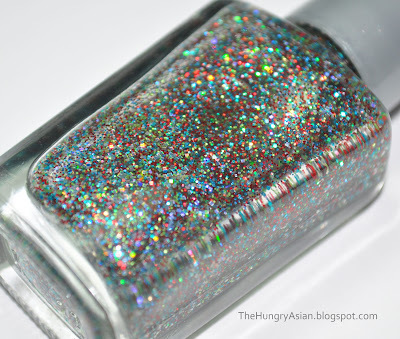 Now if only we could figure out how to thicken up clear polish lol. 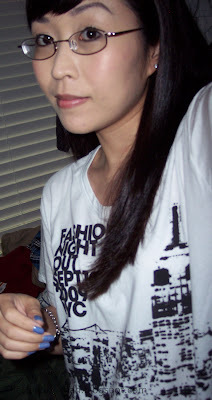 On a sort of related note, this me wearing a Fashion's Night Out 2009 t-shirt courtesy of Lancôme. This was taken almost a year ago so sorry for the bad pic! I didn't go but I get to bring a little fashion night out home with me lol. 3 coats no topcoat. I didn't wait long enough between coats so some spots are kind of gloopy and uneven. Personally I think I like this better layered. 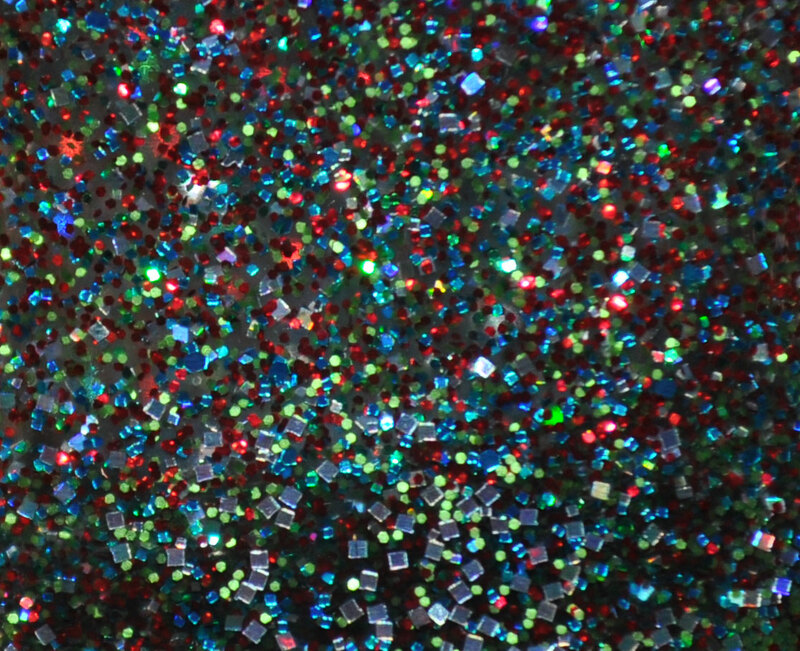 This is such a unique and colorful glitter, there's big hex glitter in silver, yellow, green, pink, orange and blue. Then small square glitters too! 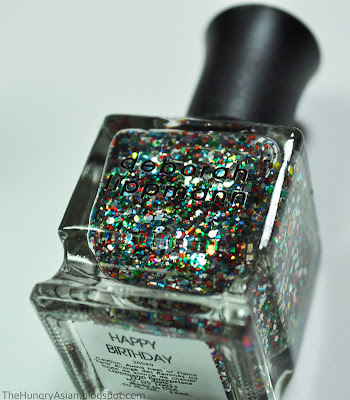 I was wearing my cookies and cream franken so why not throw in Happy Birthday glitter to the mix? Well it overwhelmed my "cookies" part but it looks so cool! A party in a bottle indeed lol. 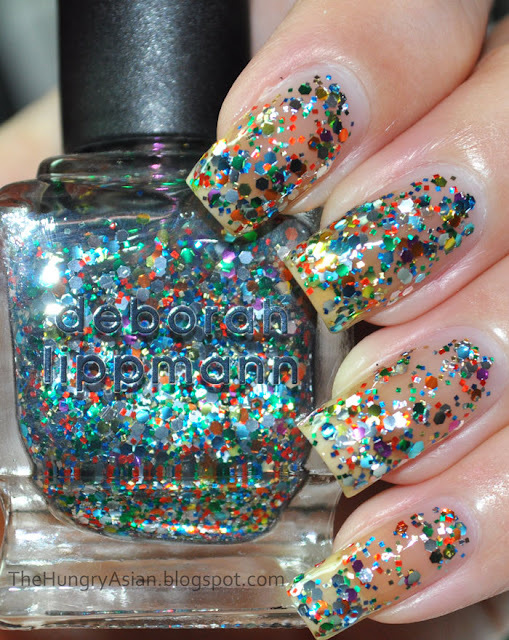 I want to try this layered in a french mani. Man I hate Blogger if my pictures aren't a certain ratio I can't choose the extra large picture option and it squishes it up. So you'll have to click to enlarge this one, sorry! This was sent to me to review. 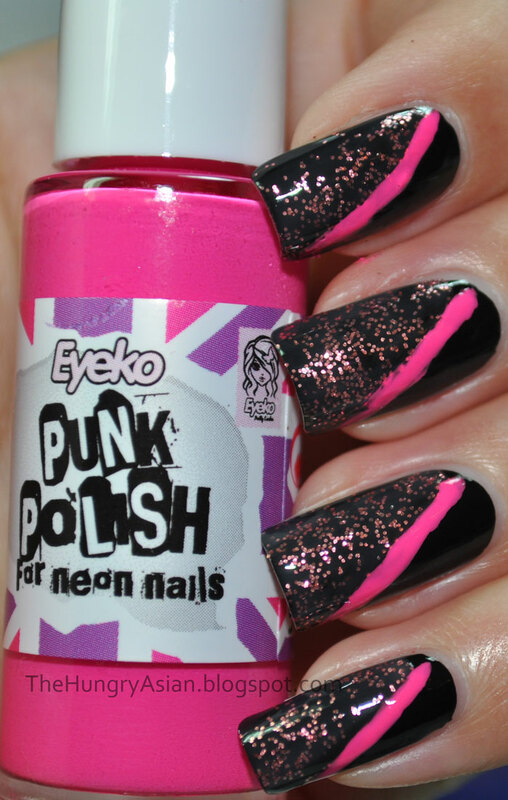 Punk Polish, 2 coats with Seche Vite topcoat. 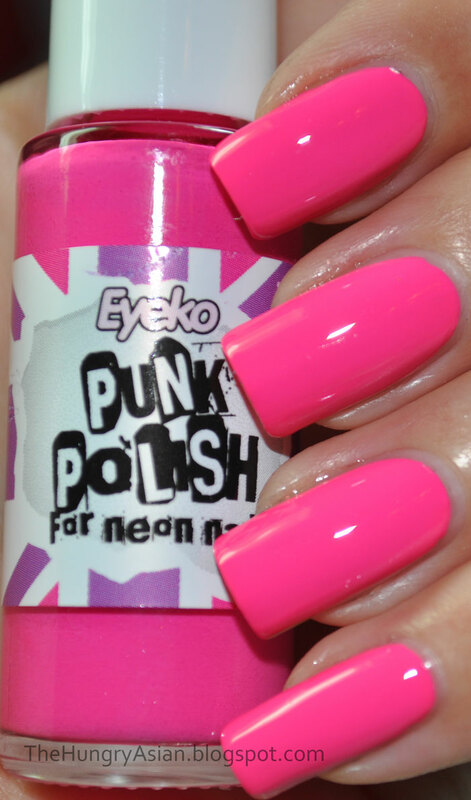 A bright neon pink, it does dry matte so you will need a topcoat to make it shiny. My bottle needed some thinning it was a bit thick. I do wish these came with balls inside. 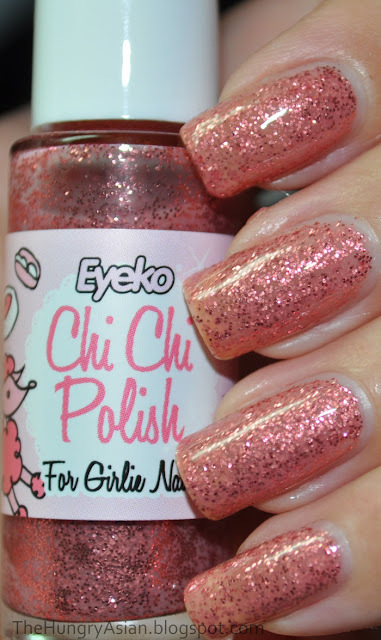 Chi Chi polish 3 coats with Seche Vite topcoat. 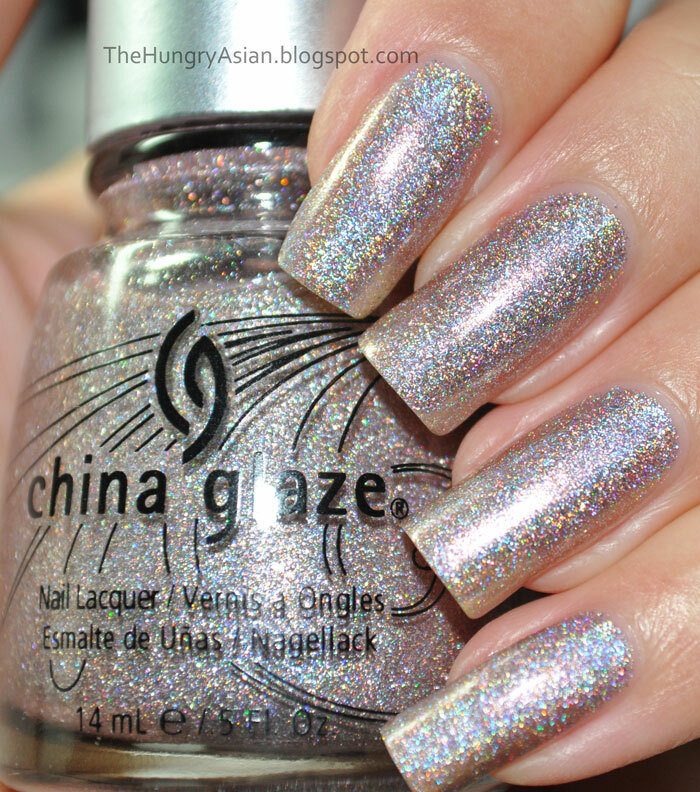 Rosy pink glitter in a somewhat milky base, very interesting. 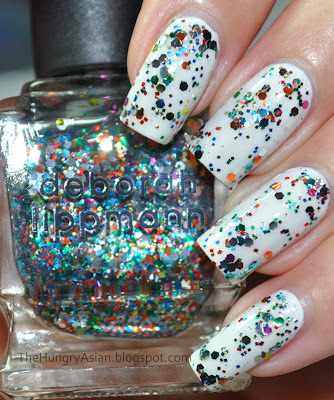 You can't really see the milkiness on your nails but it does help camouflage your nails if you wear it alone. I wanted to combine the two polishes for a complete look and here is what I came up with. 1 coat of black creme (CC Where's The Soiree?) and I just freehanded 1 coat of Chi Chi diagonally across each nail. When that dried I used my art brush to paint the line with Punk Polish. Over black you can see that Chi Chi Polish isn't in a clear base. 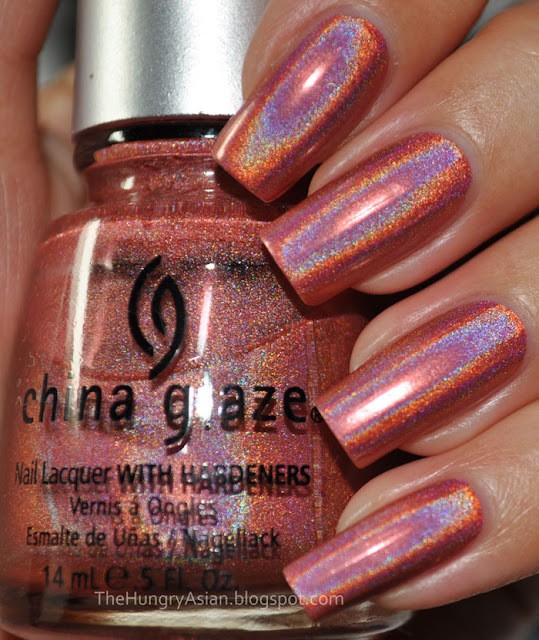 I wore Ms. Hautie for 5 days before I got a chip but I wanted to see Chi Chi Polish layered over a metallic grey first. I love this color combo! What other colors would Chi Chi look good with? 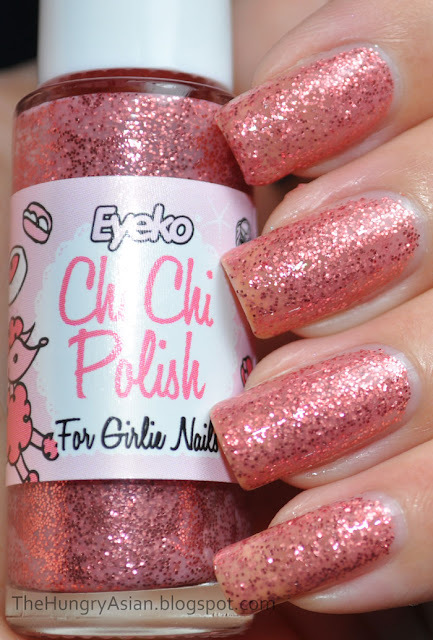 You can get these and all the other Eyeko products on their website HERE. This years set of Halloween minis is called Bewitching. Color Club makes great minis love their brush and bottles! Hey did you know they are on twitter now? Click here for the link.